Trim green beans. Add half of the summer savory to a large saucepan of boiling, salted water. Blanch green beans for approx. 2 min. and transfer to a large bowl of water mixed with ice cubes. Take beans out of cold water after approx. 1 min. and set aside. Quarter mushrooms. Mince onion. Finely slice bacon, garlic and shallots. Heat butter in a large saucepan. Fry bacon for approx. 3 – 5 min. until golden over medium-high heat. Add onion, garlic and mushrooms and continue to fry for approx. 4 – 6 min. until the mushrooms no longer give off any liquid. Add part of the flour and continue to cook for approx. 2 – 3 min., stirring thoroughly. Deglaze with vegetable stock and add cream. Add remaining summer savory if desired, rosemary, sugar, and nutmeg. Cook on high heat for approx. 5 – 7 min. until slightly thickened. Season to taste with salt and pepper. Add green beans and continue to cook for approx. 2 – 5 min. Heat some vegetable oil in a small saucepan over medium-high heat. Toss shallots in flour and deep fry in a small saucepan until browned and crispy. Transfer to a plate lined with paper towels and set aside. 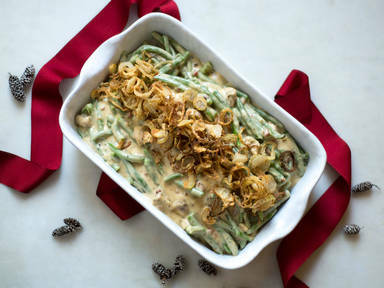 Transfer green beans and mushroom sauce to a baking dish, top with crispy shallots, and serve immediately.